The importance of retreats can be seen in the life of any spiritual person. We believe it's especially important for teens to get away from their super-scheduled lives. Retreats provide the necessary time and space to spend time with God, sacred scripture and community. Our Youth Missioner's office creates opportunities for overnight retreats throughout the year for middle and high school students. For more photos please check out our Facebook page! Note, too, if your parish offers youth retreats and would like another set of helping hands, we offer resources and help host your retreat. Do not hesitate to contact us! 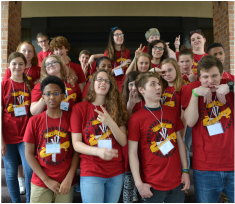 The Youth Ministry office provides programs for youth who are currently in grades 6-12. If your group has members who are younger, please contact the office and we would be happy to discuss their possible involvement. Some programs are specific to certain groups. ​. Scroll down to the event you would like to register for and click the link. One download, two options: fill out as pdf. and email return here or print and mail to address below! Payment is best made at time of registration. We are currently working on how to take credit card payment through our online registration with Formstacks. Checks can be made out to the Diocese of Maryland with name and event in memo, and mailed to the diocesan office to Attn: Youth Ministry or cash can be delivered on the day of the retreat. Download an easy to hand out version of our annual calendar! God and one another in the sacred space of the Cathedral of St. John the Divine. Nightwatch has created a safe, spirit-centered program of joyful fellowship, contemplative contemporary spiritual direction, devotional singing, and lots of fun activities. And the next day we explore some of the sights of the Big Apple! Spend the afternoon with both bishops in fellowship and fun! Hosted in part by St. John's, Hagerstown. A revamp of our annual Bishops' Bash: we will gather for a few hours of music, Bible study, and time to talk with our bishop. We ask that all adult leaders join us for a special gift and prayers of thanks! Join us for this time to gather with youth from the region and have fun. Cost: Donations for the food pantry or warming bags. This lock in celebrates that life and mission of Dr. MLK Jr.! We will have an evening focused on the sin of racism, how to continue our work to dismantle it, a film about overcoming racism, and discussion. There will also be time for fellowship and food. On Monday we take time to create posters, work on a service project, and march in the parade alongside Memorial, Bolton Hill. Please join us as we take steps for the Jesus Movement! 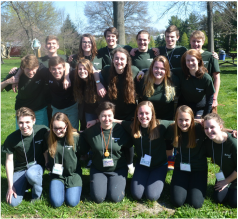 Happening is a national program designed, staffed, and run by Episcopal youth! This weekend will deepen your relationship with Jesus and connections with those on similar spiritual journeys. Most of this weekend is kept a surprise for those attending so they can fully live into the moment and the community. General activities include large group talks, small group discussion, prayer through art, and games! This retreat is similar to New Beginnings for middle schoolers and Cursillo for adults. Happening is being held at Claggett Center in Adamstown, MD. Spend the afternoon with your bishop in fellowship and fun! Hosted in part by St. Martin's-In-The-Field. A revamp of our annual Bishop's Bash: we will gather for a few hours of music, Bible study, and time to talk with our bishop. We ask that all adult leaders join us for a special gift and prayers of thanks! Join us for this time to gather with youth from the region and have fun. 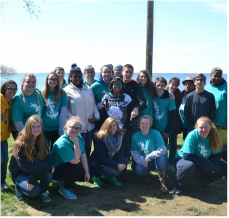 Our annual retreat for middle school youth is a fantastic weekend at Camp Wright in Stevensville, MD. Previous New Beginners that have reached high school are the designer team and staff for the weekend. This makes for a perfect sense of what it means to be a part of the community. A whole weekend dedicated to youth working through the transitions of middle school through talks, skits and small group. A place where they can find community in Christ and mentors in high school students. Campers are responsible for personal transportation to and from Camp Wright. Parents, family, and adult leaders are warmly invited to attend closing Eucharist at 2:00PM in the dining hall.